Probably no destination on the planet, surpasses the beauty of the scenarios of Machu Picchu. Seated in a breathtakingly beautiful place, most do not get to see what surrounds it on both sides, canyons, valleys, forests and snowy mountains that cut through the clouds. One of the most beautiful features of the City, is the harmony with which it is integrated the spectacular scenery. Build an urban center like Machu Picchu, today, would create a strong controversy, to assume the destruction of a unique landscape; but Machu Picchu not only do not ravage the landscape but also it became part of it and embellished it further, which has earned him the recognition of people from all over the world, including it among the 7 modern wonders. When find detained works under construction, I provide important information about the techniques used by the Incas. When visiting Machu Picchu, take a moment to imagine the effort it must assume build this city into a place like this; with everything you own, wonderful buildings, civil and religious, road networks, stairs, platforms, etc. Pachacutec decided to establish a llacta or town and royal residence in this area; a wild place, with a wild and rugged geography, between two rocky mountains, forests and cliffs. The decision of the Inca emperor meant serious trouble for engineers, architects and managers Empire stores. And even more, do without wheels, pulleys, horses, etc. There is record that sometimes, initial plans had to be altered, so that a door was converted in window, a sample of this can be seen in the enclosures of Intihuatana; in other cases they were transformed into niches as in the Temple of the Three Windows, they were actually five, but two of them were converted in internal niches. Some found underground walls under the sun temple seem to have no foundation but rather changes in the original structure of the building. How the stone was worked? Who and where the stone was worked? What other materials were used? Although in some cases, have altered the initial plan, the construction of any building, temple, palace, town or city; the Incas had implemented a planning process, which aimed to ensure somehow, success for the future. His knowledge was not only a product of creative ability but also had the ability to make your empire in a very short time, it expands both militarily and socially, acquiring knowledge of all places they conquered. Before starting any building, the Incas performed sketches, drawings, scale models and mock-ups, using measurement systems mainly based on anthropometry (measures with regard to the human body: arms, elbows, feet, steps, spans, etc.). And as proof of this, we can find lots of models, almost all archaeological museums. No other modern civilization in the world could until now, match the technique, ability and ease with which the Quechuas worked in this part of the world. It is attributed to the Incas, a balanced social organization, spectacular domain to work the stones, a knowledge of advanced design, and organized itself, without the influence of other cultures of the continent. This allowed them to develop one of the most advanced civilizations in the world. Still have questions about how they made so that the stones, perfectly carved, fit so precisely, without any glue to hold them together. Doubts generated by the lack of information, stories and old files on the use of these techniques. There are some assumptions within the logical possibilities. The most accessible, indicates a slow but effective work, with normal walls, begun carefully to the bottom, where the top ranks would be the most difficult to assemble, since the stones had to fit perfectly with the others surrounding them, technique can be found in many areas of Cusco, where top faces were carved by hitting lightly with small stone hammers, made according to the underside. Relatively simple task, being small stones, because they could be and need to be removed; but how they did hundreds of tons of stones. Studies suggest that the Inca builders, models of lightweight materials used, perhaps clay. Possibly they were reproduced exactly; using this method would have greatly facilitated the work with huge rocks. Another possibility that has no place among the researchers, is that they could use a current technique that involves taking the measure of the space in which to fit the desired shape, but this would be the problem of moving the stone, especially if many of these were weighing thousands of kilos. Much of the large stones of the Inca walls in most cases have a double notch in the lower part of their faces. Sacsayhuaman can be seen in these notches, which served to make it easier handling, transportation and lifting of stones during construction. Many of these are molded into finished walls, but for some reason is still unknown, some stones are saved yet. Qoricancha in Cusco, some exceptional cases where the inside of the wall is semicircular (known as the solar drum), and shows a very rare molding surrounding the trapezoidal niche is appreciated; it is clear that the blocks do not have to be handled that way, but should have some religious meaning. 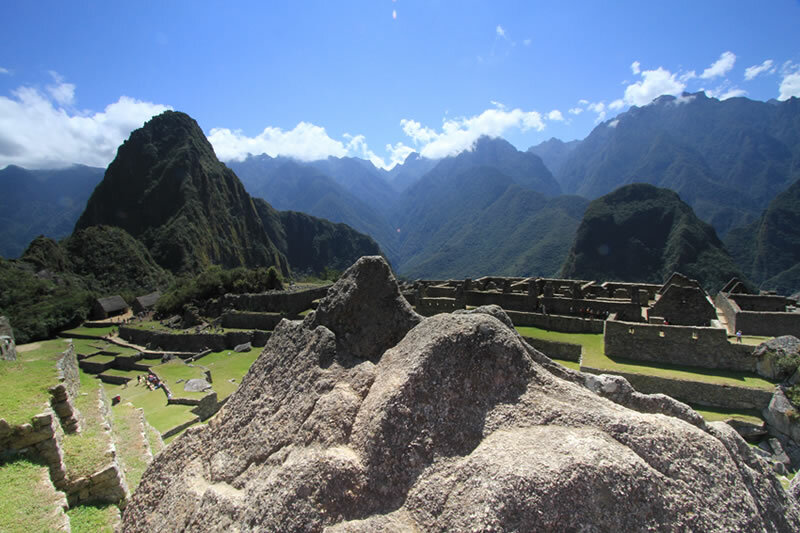 West of the Inca City of Machu Picchu may even find, the quarry from which large quantities of stone were extracted and with which the city was built; stonemasons worked there with stone hammers, crowbars and chisels of bronze alloy. Using natural fissures in the rock to make precise cuts. Granite blocks of various sizes, which were transported to buildings under construction were extracted. The transportation was based on manpower, given the absence of animals drag (the flame is not useful for this purpose) and the wheel is not known. This was done with regular tree trunks, used as bearing axes, is also used boulders and wooden sticks that served as levers, to complement the thrust. The levers were cleverly used to produce a reciprocating movement in the stone, and could serve as much, especially if the block was very large, which was displaced by a group of workers pulling ropes. Ramps and chutes are constructed for temporary use, to climb the huge stones to higher ground in the neighborhood or lift to align on a wall, said ramps were built with stones and earth, which they were then removed. One of them is still visible in the so-called Unfinished Temple, located next to the so-called Sacred Rock, this temple was in half construction when they left the Inca City. The Rustic or "Pirka": worked in rough stone, carved and accommodated in a rudimentary way (without much care); filling the empty spaces with small stones and mud. It was used in the construction of warehouses, terraces and houses for ordinary people, etc. Cell type: similar to the structure of a honeycomb appearance, made with small polygonal limestone; We can find good examples of this type in Chinchero, Tarawasi, Qolqanpata, etc. Enhanced Type: worked with igneous rocks. 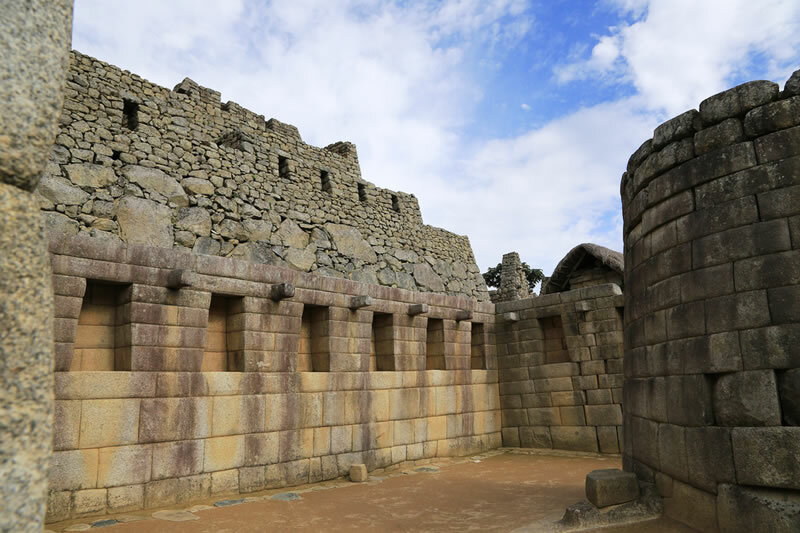 The best examples of this type of construction are: The Main Temple in Ollantaytambo, the Temple of the Three Windows in Machu Picchu, Cusco Hatun Rumiyoq, among others. Sedimentary or Imperial Type: Basically worked in medium-sized stones, regular height, positioned horizontally in rows, gives the impression of being completely rectangular. Forming nicely polished edges, with a perfect assembly, so that it is impossible to introduce a razor blade or even a sheet of paper. A very thin clay screen seems to have been put in liquid state to facilitate the transfer and handling of the stones. 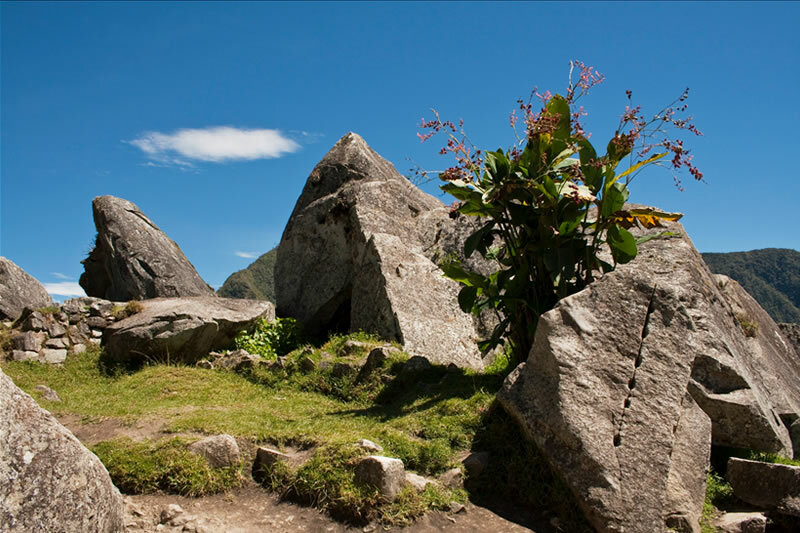 Cyclopean Type: Also known as Megalithic, it is characterized by huge boulders, many of which reach 8.5 m. high, some of these can be seen on Saqsaywaman or the Main Temple in Ollantaytambo. It is frequently seen that the Inca walls are wider at the bottom than at the top part. So we can conclude that the most widely used form of Inca architecture is the trapezoidal, which provides stability and sense of balance. There is no denying the investigation of his immortality; by people who study how to make buildings resistant to earthquakes, eternal and indestructible to any natural disaster. Their roofs usually built with wooden beams and covered with ichu (local straw). According the rooftops shape they are classified in 4: a slope; two slopes; four slopes and conical. Just imagine how impressive are some structures of large buildings such as the Temple of Wiracocha in Raqchi had a "Kallanka" of 92 x 25 m. in an area of 2,323 m2. Due to the materials used and the amount of rainfall during the year, the roofs have an inclination ranging from 50 ° to 65 °. The ichu not last forever, so the ceilings received maintenance, renewed every three or four years. Other impressive features are the channels of rivers like the Watanay and Willkamayu (Urubamba). Rivers were indicted in a straight line. Even now in some parts of these rivers you can be seen carved stone walls. You can find foundations of bridges served to cross rivers. And some that resist to the time like the Qheswachaka bridge over the Apurimac River. Which is maintained with community work by the people who use; with an inherited Andean technique. The adobe (mud brick). Many buildings, even entire cities in the Tawantinsuyo empire, were built with this material; Such is the case of Pachacamaq south of Lima. These "bricks" were worked good earth (clayey) mixed with straw from the area (ichu), and on rare opportunities with alpaca wool. The materials are mixed with water, and were placed in rectangular molds before being sun dried. In the highlands of Peru yet they are constructed adobe buildings, which are preferred because of the ease with which they can access their raw materials, such constructions are durable, the walls are covered with plaster and is protected by tiles.